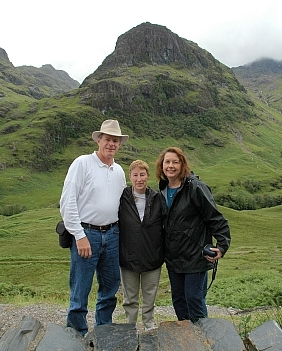 Photo: Campbells, McDonalds meet again at Glencoe. 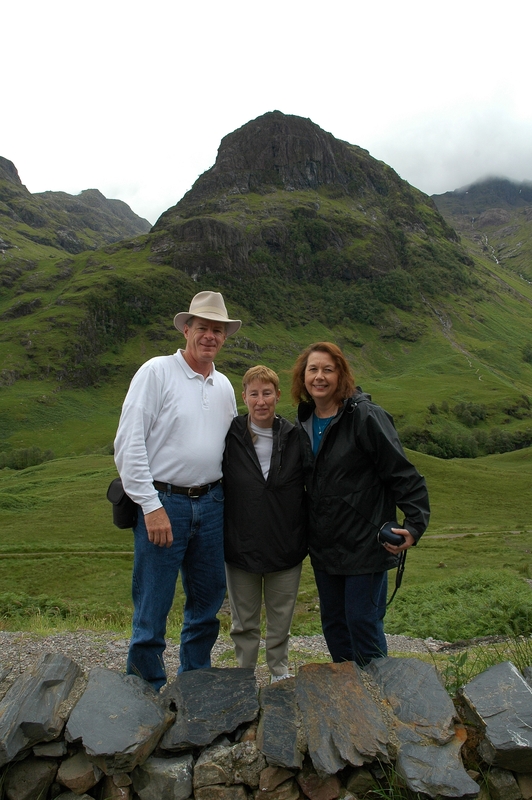 Mary’s sister, Pipi Campbell Peterson (center), traveled to Scotland last year and, near the site of the infamous Glencoe Massacre, met Scott and Diane Fletcher. Scott’s mother was a McDonald. Pipi and Mary are co-authors of Ready, Set, Organize. Sister Alma Rose is the alter ego of Mary Campbell, who writes about Sister Alma Rose in her book series The Ancients. Mary Campbell is a writer, small-business adviser, poet… an avid meditator… a teacher of poetry and business marketing, particularly as it relates to writing and branding… a creator of quirky greeting cards and spiritual gifts (including the book Unfamiliar Territory: Prayers, Poems, Meditations, and Household Hints). She devours the writing of Anne Lamott, Diana Gabaldon (and Claire and Jamie), Dorothy L. Sayers, Jane Austen, Philippa Gregory, and Sir Walter Scott. She is a composer and musician. She lives in a church basement in Omaha, Nebraska. Visit her website, www.LifeIsPoetry.net, and PLEASE sign the guestbook to receive your free (even prestamped!) Random Cards of Kindness. Enjoy the meditation pages, with instructions, nature sounds, and music for meditation… including the “Peace and Quiet” music of Rick Kuethe. Write to her at mary@LifeIsPoetry.net…. Hi, Valerie. I’ve had a lot of computer problems so it’s taken all this time for me to read your kind words. I’m glad something in my blog resonated with you. It seems to me that love transcends belief and nonbelief… but then, to me, “Love” is one of the names of God. In one of the free classes from the Meditation Society of Australia, the narrator explains, using terms from quantum physics, that everything is energy and all energy is love. I’m not trying to “convert” you from atheism. Organized religion, with all its rules and “holy wars,” hasn’t done much for God’s image. Lady Jane Grey, Queen of England for nine days in the mid-1500s, went under the axe at the order of her cousin Queen Mary I (“Bloody Mary”) because she, Jane, a Protestant, refused to accept the possibility of transubstantiation — would not even consider that the Eucharist — the bread and the wine — physically became the body and blood of Christ when consecrated. She was 17 and a brilliant scholar. Transubstantiation isn’t even biblical, it’s just this made-up Catholic thing dating from the 12th century. Jane’s uncle and Mary’s father, King Henry VIII, had executed Catholic priests, seized the monasteries and awarded them to his most loyal nobles, and turned the monks out in a brutal wave of anti-Catholicism. A generation later, Queen Mary was burning Protestants on crosses placed at street corners throughout London. But I don’t denounce Christianity entirely. In an earlier era, I might have been a Quaker. At one time I almost became a Mennonite.